This is a fun little game of SCOOT designed for your students to use when practicing the location of information inside a nonfiction text. This set contains a nonfiction passage for your students to use, along with 24 SCOOT cards that can be placed around the room or in a learning station. Students use the text to answer the questions as they go through the game. Skills included are: Basic location of information, using context clues in text to determine word meaning,author's purpose,synonyms, making connections, cause and effect, character traits,, and summarizing. 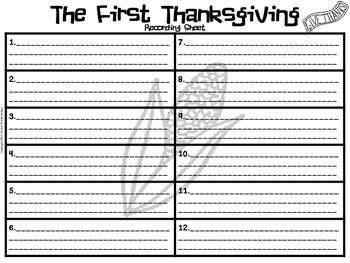 This is a fun way to have your students learn about the very First Thanksgiving and give them some much needed practice with nonfiction text!